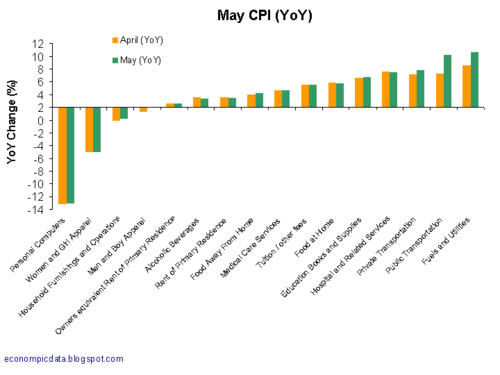 The Big Picture The Big Picture | CPI Goes Higher on Food, Energy, Transportation, Medical, Tuition & Books, Restaurants, Alcohol, Rent, etc. 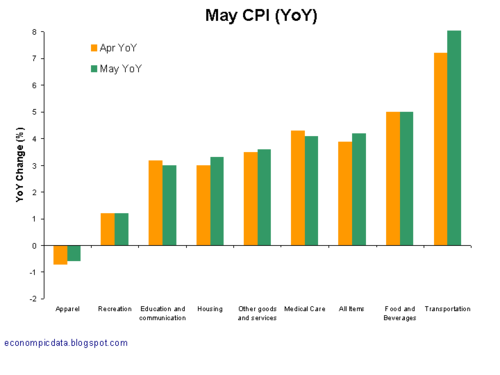 CPI Goes Higher on Food, Energy, Transportation, Medical, Tuition & Books, Restaurants, Alcohol, Rent, etc. If you are purchaser of computers, women's clothing, or household furnishings, well then I have some good news for you: Everything is on sale, and prices are falling! However, if you regularly buy Fuel, use transportation, need hospital services, education, books, eat food at home, pay tuition, require medical care, eat out, drink booze, or pay rent, well, sorry: Everything is costing you more. Even if you back out food & energy -- inflation ex-inflation -- we still have rising prices, and elevated inflation expectations. This leaves the Fed painted into a corner -- the weak dollar, caused in large part by low rates, is adding to inflation. But the recession and the credit crunch are preventing the Fed from appreciably raising rates. one wonders about that computer number. the whole geometric substitution thing is a load of crap. yeah, i'm getting twice the power, but if a 'middle of the road' computer costs two hundred more this year than last, how is that not inflation? but hey, you have to have some sunshine amidst all the rain.